Hang out at enough beer events these days and it’s possible to hear the theories people have about the overall industry. Some turn out to be true, like the rumblings in years past that session beers would gain ground on the more extreme, high-alcohol beers. Others are a little more far-fetched, like those who say that sour beers are the next IPA. India pale ale is one of the most popular categories in beer today, and the most entered each year at the Great American Beer Festival. Sours are intriguing, complex and downright wonderful if done well, but it’s unlikely that the category will unseat the hoppy crowned prince. 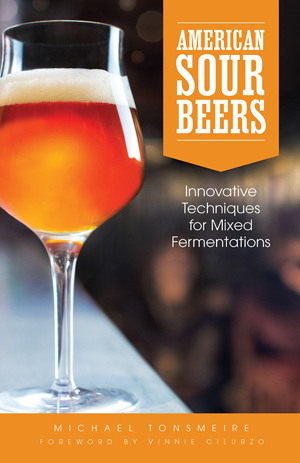 If it does, however, here is Michael Tonsmeire with American Sour Beers: Innovative Techniques for Mixed Fermentations, an exhaustive yet lively guide to all things sour beer. There are the engaging stories of U.S. brewers who went intentionally sour before it became de rigueur and recipes for trying a sour homebrew, but mostly this is a textbook. It’s a well-researched, clearly written look into an often misunderstood category that deserves to be devoured by all who hold it. Amid the methods, the detailed descriptions of wood and wild yeasts, the one thing missing from this book is more photographs and illustrations. For those already in the cult of sour beers, this is the new bible, and converts are welcome.